Recorded during the month of July 2004. Data was acquired by walking the cemetery, copying data from markers, as well as viewing the records of the Buckingham Cemetery Association. We are grateful for their cooperation in this effort. The cemetery is located on the outskirts of town near the corner of P Ave and 160th St just off Hwy 63. Going north on Hwy 63, turn left on 160th St, go 1/2 mi, turn left on P Ave, go short distance, cem on left. There are approximately 4,475 graves in the cemetery (of these about 60 are unmarked and an additional 70 "surname" burials, i.e. Smith burial with no dates or marker; Five maps covering the whole cemetery (broken up in 5 sections:EA, NA, NG, OG and WA) are listed at this website and will match up with the Location (Loc) numbers shown below. There are several markers with dates written in the Czech language. Most could be translated. There are a few words which could not be identified and you will see the Czech words where a month should be or in the Comments column. Reference is made occasionally to the Card File or Old Book. The Old Book was the first record of deaths maintained by the Cemetery Association. It later became necessary to modernize the record keeping and a switch was made to a card index system. Occasionally there were discrepancies between the card file, the old book and the grave markers and these were noted as they occurred. When people purchased plots, they were known as the owner of those plots and their names appear here as a result of the purchase. Many of these have no markers in the cemetery and therefore, no dates. When death dates are present for the owner of the plot, the word "Owner" no longer appears. This is a very old cemetery. There are more than 330 people resting here who were born before 1840. The most notable occupant is James Wilson, better known as Tama Jim who served as U.S. Secretary of Agriculture under the McKinley, Roosevelt & Taft administrations. Also notable are the Bunker boys who were hanged in 1860 as horse thieves. Their graves were not found when recording the cemetery but supposedly are located a short distance from Tama Jim in the Old Ground. In 1879 a plot could be acquired for the sum of $5.00 (consisting of 12 spaces) In 1889 it was necessary to raise the fee to range from $10 to $25. By 1904 the cost of a 20x20 lot was $30 and a 10x18 $15 (fractions in proportion). One space in a lot today can cost as much as $200 (or $400 with perpetual care). In 1884 the Cemetery Association ruled that trees are to grow to no more than 3' 6" in height. There is one big tree in the center that obviously was unaware of this ruling. In 1885 the Association felt that a fence should be built and a hitching post should be erected in front of the cemetery and that no carriage shall enter the cemetery with the exception of the hearse carriage. In 1889: For more efficient use of the cemetery, the Board decided to move bodies from lots that were Unknown to the SE corner of the new cemetery. Thirty-six graves were moved and Bert Ready was hired to move them for $1 each. 1943 regulation: the Sexton of Buckingham Cemetery hereafter shall make the same charge for digging graves whether summer or winter, based on the size of the vault. Winter being defined as December 15 to April 1. Previously there was an additional charge of $1 for winter due to the frozen ground. July 1950: The Rules & Regulations of most cemeteries was: Father to be buried to the right of the wife and children on either side of the parents. In some cases, the first wife was buried to the left and the second wife to the right of husband. Also it was customary to bury facing East or the head to the West. There are approximately 4,475 graves here (approx.60 of these are unknown and without markers and about another 70 that 'surname burials'; such as Smith burial but with no dates or markers). 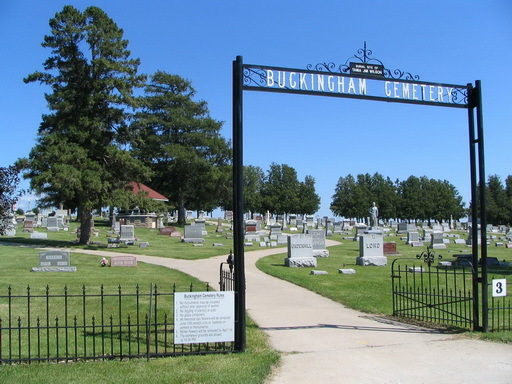 Records were compiled by walking the cemetery and recording data from markers as well as burial records held by the Buckingham Cemetery Association. The cemetery is still accepting burials. It is attractive and well-maintained and sits on a small hill at the edge of town with a panoramic view of the corn fields and bean fields below. NG 159 Ackles William 1846 1921 h/o Esther? NA 101 Adamek Lucille 1919 ss w/Edward G.
EA 051 Addison Essie V. 01 May 1909 07 Feb 1998 ss w/George S.
NA 099 Allen Clifford G. 1917 15 Dec 1998 Id; ss w/Mabel I.
NA 045 Allen Iona Jane 1907 27 Jun 1988 Id; ss w/Roy E.
NA 007 Altenhein Alta A. 1886 1973 Mother. NA 007 Altenhein J. Gertrude 1913 29 Aug 1988 Id; ss w/Paul A.
NA 018 Altwegg Jessye F. 1892 1973 ss w/William H.
NA 018 Altwegg William H. 1878 16 Nov 1956 Id; ss w/Jessye F.
OG 010 Ames Asa Lee 1859 08 Feb 1934 Id; c/o J.T. & M.J.
OG 011 Ames Florella M. 1880 1975 Match'g stone w/John T.
OG 011 Ames Isabel M. 02 Nov 1879 17y; d/o J.T. & M.J.
OG 011 Ames J. T. 1819 1902 Match'g stone w/M.J. OG 011 Ames M. J. 1834 1905 Match'g stone w/J. T.
OG 063 Antrim Aden 21 Apr 1830 10 Mar 1917 b. OH; h/o Elizabeth A.
OG 028 Ashbaugh Jesse 1888 1920 ss w/Nelle M.
OG 028 Ashbaugh Martha E. 1858 28 Jun 1945 Id; ms w/John W.
OG 044 Ashton Lillie May Unreadable stone ...May?? WA 041 Axon John Frederick 17 Nov 1911 17 Nov 1911 s/o B. & K.
WA 041 Axon Margaret Marcello 18 Nov 1919 09 Feb 1920 d/o B. &K.
NA 018 Axon Raymond 1916 07 Feb 1999 Id; ss w/Genevieve E.
OG 140 Axon Ross E. 1882 07 Sep 1957 Id; Son; ms w/Sarah A.
OG 131 Baker Dwight E. 1852 12 Jun 1932 Id; h/o Mary L.
OG 131 Baker Mary L. Turneaure 31 Jul 1853 16 Oct 1912 w/o Dwight E.
NG 078 Barbour Ella Gaston 30 Dec 1856 28 Mar 1898 c/o H.F. and E.S. OG 156 Barr R. Bessie 1877 07 Feb 1980 Id; ss w/Frank A.
NA 088 Beaver Vernon E. 1923 22 Jan 1990 Id; h/o Gladys M.
NG 044 Becket Minnie 1876 1917 Mother; w/o John M.
NG 044 Becket Ruth 1907 1907 Inf dau of J.M. and M.
WA 086 Berger Abigail Kern 1869 14 Jan 1958 Id; Mother; ms w/John W.
NA 024 Bloomquist Agnes J. 23 Sep 1899 12 Jan 1964 Matching stone w/Frank W.
NA 024 Bloomquist Frank W. 03 Jun 1892 23 Jun 1958 2nd Lt Inf Res WW I; Am Leg. NG 185 Boettcher Herman L. 1840 1916 Father;h/o Ida J.
NG 185 Boettcher Ida J. 1858 1938 Mother; ms w/Herman L.
WA 099 Boettcher Ruth R. ss w/Alvin H.
WA 045 Bohnsack Betty J. 1933 ss w/William R.
NA 015 Bohnsack Clarence C. 1891 10 Jan 1964 Id; ss w/Ella M.
NA 015 Bohnsack Ella M. 1896 01 Mar 1957 Id; ss w/Clarence C.
WA 045 Bohnsack William R. 1929 ss w/Betty J.
WA 188 Boldt Agnes 1909 05 Apr 2003 Id; ss w/Harold E.
NA 030 Bovey Randy F. 1956 20 Oct 1958 Id; s/o Fred B.
NG 106 Bowen Elizabeth 1856 20 Jul 1935 Id; ss w/Will H.
NG 254 Bower Bert E. 1870 22 Jun 1955 Id; ms w/Etta L.
NG 254 Bower Etta L. 1874 07 Mar 1961 ms w/Bert E.
NG 254 Bower Nancy B. 28 Feb 1850 19 Jun 1929 w/o Daniel. T.
NG 184 Boylan Martha 1819 1897 Mother. Card file indicates her name is Martha but stone only says "Mother"
NA 042 Branson Gwendolyn E. 1912 31 Jul 1997 Id; ss w/Irwin R.
WA 085 Brassfield Mary 1862 23 Sep 1936 ms w/A. C.
WA 089 Breakenridge Agnes E. 01 Jan 1887 14 Sep 1903 ss w/Anna M.
WA 089 Breakenridge Anna M. 07 Oct 1885 28 Nov 1902 ss w/Agnes E.
WA 089 Breakenridge Doris Mae 1923 1924 d/o W.J. & S.E. NA 051 Breakenridge William R. 1956 20 Mar 1976 William Ralph was known as "Billy"
NA 013 Bredfeldt Gladys M. 1902 29 Oct 1980 Id; ss w/Leonard A.
NA 013 Bredfeldt Leonard A. 1901 Jan 1963 Id; ss w/Gladys M.
EA 080 Brennan Francis Alan 1947 06 Dec 1999 Id; ss w/Margie L.
WA 030 Briggs Lorraine 12 Jun 1926 Id (log book notation: "Gerry's twin sister)"
NG 174 Briggs Maxine L. 1927 ss w/Wilson A.
NG 174 Briggs Wilson A. 1920 1994 ss w/Maxine L.
NG 134 Brink burial Data fm card file-is this E.S. Brink? EA 043 Brown Elizabeth J. 1913 26 Feb 2002 Id; ss w/Marvin E.
WA 137 Bruns Lorna Jane 1925 26 Apr 1982 Id; ss w/Melvin A.
OG 130 Bryson Calista L. 1854 02 Aug 1955 Id; Amer.Leg.Aux. OG 130 Bryson Cora L. 1885 15 Aug 1978 ms w/Leo A.
OG 130 Bryson Leo A. 1894 17 Jun 1987 US Vet; ms w/Cora L.
OG 149 Bryson Pearle S. Green Hasbrook 1894 17 Mar 1987 w/o Benjamin L.
WA 160 Buffington Fern E. 1929 ss w/Merlyn G.
OG 032 Bull J. Herman 18 Sep 1864 1y 26d; c/o J.L. & E.M.
WA 087 Burmeister Mildred Haack 1902 Feb 1979 ss w/Harry J.C.
OG 116 Burns M. Janet McEwen 1925 reserved; ss w/Frank C.
WA 083 Burrows Leonard L. 1914 Apr 1983 ss w/Mildred L.
WA 083 Burrows Mildred L. Kanis 1915 03 Apr 1957 Id; ss w/Leonard L.
NA 054 Burton Eloise J. Rottler 13 Nov 1921 15 May 2004 Id; ss w/Gene W.
WA 038 Calderwood Arthur J. (Jr) 10 Jun 1914 18 Sep 1977 ss w/Irene C.
WA 154 Calderwood Opal Faye 1941 only 1 date & words "Angel"
OG 027 Camery Annie 03 Oct 1893 64y 4m 2d; w/o Christian P.
OG 027 Camery M. Almeda 1859 1939 ms w/R. A.
NG 050 Campbell Elvira Gibson 28 Dec 1843 28 Oct 1880 w/o Frank H.
NG 032 Carpenter John Quince Jan 1842 1912 b. NY; ss w/Belle J.
NG 128 Carpenter Theodosia Smith 1881 06 Mar 1968 no marker; id; w/o John A.
NG 057 Carswell John Possibly father of Aggie & Wallace. NG 057 Carswell Wallace 09 Oct 1891 5y 22d; s/o J. & J.
OG 035 Chamberlain Alvaro E. 1849 1918 h/o Mary E.
NG 198 Childs Fred J. 1872 30 Oct 1952 Id; ss w/Sarah L.
NG 179 Childs Gladys E. 1913 19 Dec 1995 Id; ss w/Lawrence K.
NG 179 Childs Lawrence K. 1905 08 Mar 1993 Id; ss w/Gladys; Fire Dept. NG 198 Childs Sarah L. 1870 14 Oct 1948 Id; ss w/Fred J.
WA 082 Chizek Matie H. 1906 01 Apr 1993 w/o Edward F.
WA 088 Clark James D. 1905 1911 Son; s/o Wm J. & Lydia D.
NA 032 Claussen Victor E. 1903 08 Jul 1989 Id; ss w/Elsie B.
NG 132 Clow Amelia L. 1843 1913 ss w/Charles A.
WA 046 Cole Pierce 1864 15 Jul 1936 Id; Father; ss w/Cora V.
NA 004 Congdon Jane Harriet 1913 ss w/Russell E.
WA 189 Conner Carmi M. 1904 19 Aug 1983 Id; ss w/Ruth A.
EA 036 Coonrad Frank R. 1940 Reserved; ss/ Joanne M.
NG 120 Cowan Edna C. 03 Aug 1907 06 Sep 1989 Matching stone w/Dean E.
WA 008 Cox Adella H. 1862 07 Feb 1920 Id; w/o Elmer E.
WA 066 Crabbe Jessie 1872 18 May 1942 Id; ms w/Albert A.
NA 046 Crandall Everett C. 19 Sep 1912 21 Nov 1973 ss w/Neva M.
NA 046 Crandall Neva M. 27 Feb 1917 10 Sep 1966 ss w/Everett C.
WA 090 Crawford R. Wendell 10 Apr 1903 02 Sep 1994 Id; ss w/Pearl E.
EA 042 Crawford Robert John 14 Oct 1930 19 May 2003 Id; h/o Shirley J.
OG 149 Crawshaw Annette M. 04 Apr 1886 1y 4m 10d; c/o E.M. &A.M.
OG 149 Crawshaw Eddie E. 08 Jan 1884 1m 19d; c/o E.M. & A.M.
WA 040 Crowley Grace E. Fleming 1906 09 Feb 1994 Id; ss w/LeonardM. WA 040 Crowley Leonard M. 1907 27 Aug 1985 Id; ss w/Grace E.
OG 121 Crum John F. 24 Oct 1851 3y 7m 3d; d. in Ohio; only child of C.H.& H.E. NG 191 Curel Bert Arthur 1883 29 Dec 1948 Id; ss w/Jessie M.
WA 064 Currell John Watson (Sr) 1892 19 Jun 1949 Id; ss w/Ruth A.
WA 033 Currell Wayne Chatfield 1919 12 Aug 1930 Id; s/o W.C. &M.
WA 163 Dalziel John Melby 1873 28 Sep 1955 Id; ss w/Jane D.
OG 143 Dalziel Margaret R. 1870 1915 w/o David P.
NA 033 Dalziel Merle 1906 05 Nov 1972 Id;ss w/Marguerite; Traer Fire Dept. OG 125 Daniel Nell M. 1870 20 Feb 1964 Dau of Janet L.
NA 030 Danker Edward H. 1896 27 Oct 1959 ss w/Juliane M.
NG 059 Davis Elmer 09 Mar 1884 1y 5m 13d; s/o M.E. & M.E. NG 059 Davis H. W. Owner; unreadable marker-possibly H.W. EA 035 Degner Nancy A. 17 Oct 1929 ss w/Dean W.
NG 246 Demange Robert F. 1908 23 Jun 2001 Id; ss w/Fern A.
NA 116 Dieleman Clifford W. 08 Oct 1915 07 Jan 1992 ss w/Rosie M.
NA 116 Dieleman Rosie M. 10 Jul 1919 27 Jun 2000 ss w/Clifford W.
WA 027 Dinsdale Baby 1908 1908 s/o G.J. & E.A. WA 027 Dinsdale Baby 1910 1910 s/o G.J. & E.A. WA 011 Dinsdale Lillian M. 1902 1977 No marker for Mary - is she Lillian Mary? NA 063 Dinsdale Marilyn 12 Jan 1932 ss w/Calvin W.
WA 011 Dinsdale Mary No mrkr; is this Lillian M? NA 074 Dolezal Lucille A. 1910 19 Oct 1984 Id; ss w/Francis J.
NA 075 Dorus Diane K.
OG 062 Dougan Ida W. 17 Jun 1884 14 Oct 1962 Mother; w/o George H.
NG 072 Downs Margaret Oct 1879 86y; m/o Mary L.
WA 051 Draper Adelaide 1878 1932 ms w/Bertram H.
WA 122 Draper Bertie M. 1902 31 May 1949 Id; w/o Norman W.
OG 126 Draper Gladys 1904 1996 ss w/John L.
NG 246 Draper Glenn E. 1901 1983 ss w/Alyce M.
OG 126 Draper Kate 1868 29 Oct 1951 Id; ss w/Elmer N.
NG 246 Draper Lewis E. 1871 24 Jul 1947 ss w/Sadie M.
NG 037 Draper Lucille 1909 29 Aug 1989 Id; w/o Fred C.
NA 078 Draper Norman P. 1911 h/o Alta M.
WA 122 Draper Norman W. 1898 1969 ss w/Bertie M.
NG 246 Draper Sadie M. 1881 17 Jun 1962 ss w/Lewis E.
OG 066 Dravo Frances 08 Nov 1899 74y 2m 10d; ss w/Samuel D.
NA 044 Drinovsky Martha C. 1904 25 Sep 1992 Id; ss w/Wesley A.
EA 044 Drinovsky Mary Ann 1927 ss w/Wilbur W.
WA 184 Drinovsky Minnie 1893 17 May 1947 Id; ss w/Louis E.
OG 082 Dunlavey Charles H. 1878 18 Apr 1956 Id; ss w/Ella M.
OG 082 Dunlavey Ella M. 1877 1957 ss w/Charles H.
OG 000 Eames ? ?ittie (cannot read Oct 1860 2y 10m 19d; d/o M.V. & F.M. ; possibly 10-13-1860. OG 116 Earley Mary Stark 1898 1963 ms w/Frank M.
WA 012 Early Katie 1881 1915 Mother; w/o Earnest G.
NG 053 Early Leone 1895 03 Apr 1956 Id; w/o Elmer T.
WA 012 Early Lillian 1890 1983 ss w/Earnest G.
NG 053 Early Sarah Scott 1850 1918 w/o William C.
NA 066 Eckhardt Rosetta M. 1912 09 Nov 1994 Id; ss w/Robert D.
NG 072 Eckles Mary L. Downs 12 Apr 1882 55y; w/o James L.
OG 123 Edwards Edla R. 1879 1908 ms w/Bert W.
WA 014 Edwards Luther H. 1849 1926 h/o Elizabeth W.
OG 102 Endicott Emma K. 1887 1981 ss with W.O.Z. OG 102 Endicott W. O. Z. 1883 1972 ss w/Emma K.
EA 039 Engel Barbara A. 1933 Reserved. ss w/Robert R.
NA 109 Engel William C. 1902 14 Jun 1983 h/o Dora H.
NG 063 Estle Daniel 31 Oct 1895 71y 4m 10d; h/o Mary E.
NA 001 Ewing William Paul 1888 1972 ss w/Laura S.
NA 038 Ewoldt Delbert J. 1902 06 Jun 1997 Id; ss w/Lois C.
NA 038 Ewoldt Lois C. 1915 ss w/Delbert J.
WA 046 Eyres Marguerite Feb 1982 ss w/Phillip I.
OG 000 Fairbanks Abbie O. 26 Aug 1869 d/o ? can't read; "In memory of Abbie F". NG 219 Farnham Jean Brown 1880 1969 ss w/Alford J.
NG 218 Feakins Mary 1872 18 Nov 1967 Id; ss w/William H.
OG 020 Fett Herman E. 1893 29 Nov 1980 ms w/Mary A.
OG 020 Fett Mary A.; 1891 1987 ms w/ Herman E.
OG 107 Finch Hattie A. 1848 1916 ss w/John D.
WA 090 Findley Emory C. 1873 19 Jun 1945 Id; ss w/Grace E.
WA 090 Findley Grace E. 1871 08 May 1929 Id; ss w/Emory C.
NG 232 Findley Margaret E. 16 May 1841 16 Nov 1913 Mother; w/o Joseph T.
NG 232 Findley Ottie 05 Jul 1885 4y 9m 29d; s/o J.T. & M.E. WA 116 Fink Emma 1886 11 Jul 1964 Id; ss w/John F.
NA 059 Fink Lester F. 1910 Sep 1974 ss w/Viola A.
NA 059 Fink Viola A. 1908 15 Jun 1993 Id; ss w/Lester F.
NA 080 Finks Arthur J. 1894 1973 WW I; ss w/Forest V.
NA 080 Finks Fern E. 1902 09 Oct 1993 Id; ss w/Isaac L.
NA 080 Finks Forest V. 1902 1981 ss w/Arthur J.
NA 080 Finks Isaac L. 1896 26 May 1990 Id; ss w/Fern E.
WA 149 Fleming Annie L. 1881 1965 ss w/James T.
NA 112 Fleming Gertrude M. "Gertie" 1914 29 Sep 1992 Id; w/o Clark;p/o Richard & William R.
WA 149 Fleming James T. 1879 10 Oct 1948 Id; ss w/Annie L.
OG 040 Fleming Jane Eliza 14 Feb 1841 03 Jan 1906 Mother; w/o J.W. NA 057 Fleming Lester G. 1886 1969 ss w/Mabel M.
OG 040 Fleming M. Ruth 04 Aug 1899 11 Mar 1989 ss w/John P.
NA 057 Fleming Mabel M. 1893 04 Apr 1983 Id; ss w/Lester G.
OG 139 Foote Martha S. 1852 08 Aug 1942 Id; large 2-family mrkr: "Foote/Stewart"
WA 036 Franklin Ernest A. 1876 22 Mar 1944 Id; Father; ss w/May W.
EA 066 Fuller G. Carol 1937 ss w/Roy E.
NG 179 Galley Fleeda 1865 1959 Id;Id; matching stone w/Chas. P.
WA 132 Garston Anna s. 1871 16 May 1933 Id; ss w/Willis W.
NG 077 Garston Denver Dayton 1870 30 Mar 1953 Id; s/o Hugh F & Eliz. S.
NG 078 Gaston James F. 03 May 1855 12 Jan 1898 c/o H. F. and E. S.
NG 105 Gaston John S. 1859 1930 ss w/Lena S.
NG 105 Gaston Lena S. 1865 1938 ss w/John S.
NG 078 Gaston Mattie 26 Mar 1882 21y 3m 15d; d/o H.F. & E.S. NG 078 Gaston Minnie Ann 1879 17 Nov 1951 Id; ss w/Wallace D.
WA 132 Gaston Willis W. 1863 01 Jun 1937 Id; ss w/Anna S.
WA 061 Gates Delia V. 1892 1976 ms:Delia/Alvah/Mary E.
WA 127 Gerry William E. 1854 08 Feb 1940 Id; h/o Amanda C.
WA 132 Geyer George H. 1860 20 May 1934 Id; ss w/George H.
WA 150 Geyer Grace Budgett 1888 15 Jul 1953 Id; ss w/Clifford M.
WA 132 Geyer Sophia Charlotte 1869 1947 Mother; ss w/George H.
OG 002 Gillian Estella J. 05 Sep 1864 d/o G.D. & O.A. WA 115 Gilmore Harry N. 1872 1940 ss w/Mabel L.
WA 115 Gilmore Mabel L. 1874 01 Jul 1947 Id; ss w/Harry N.
WA 087 Goetsch Irene Stolnacke 1904 1994 ss w/John W.
WA 087 Goetsch Robert L. 1941 1993 "In loving memory of"
NG 248 Gordon LeRoy O. 1874 1939 h/o Lena E.
OG 139 Green Baby Inf son of J.E. & J.A. NA 021 Green Harry E. 1880 15 Nov 1956 Id; ss w/Harriett D.
WA 160 Green Irene K. 1884 1968 ss w/Omer W.
NA 014 Green Joseph Edward 1878 1965 ss w/Jessie A.
OG 149 Green Maria T. 18 Sep 1893 68y 3d -is her name Margaret? WA 006 Green Oral J. 1892 1916 s/o A.J. & H.L. NG 192 Greene Fred Jay 23 Mar 1886 26y 8m 14d; s/o J.V.B. &P.L. NG 192 Greene Philinda L. 12 Jan 1836 30 Jul 1921 w/o J.V.B. WA 060 Gregg Alice 1853 28 Oct 1935 Id; ms w/William H.
NG 165 Gregory Harriet N. 30 Apr 1821 03 Dec 1908 ss w/Dennis B.
NA 083 Greve Robert D. 16 Apr 1959 16 Jun 1992 f/o Robert W & Jennifer M.
OG 023 Griffin Mary Maude Young 1892 15 May 1967 Id; w/o John L.
WA 069 Guynn Sarah Eliz. Oct 1858 1939 ms w/Joseph S.
WA 069 Guynn Joseph S. Mar 1848 1922 ms w/Elizabeth F.
WA 087 Haack Henry Owner? ; should this be Harry? or Henry? WA 091 Hagge Agnes M. 1886 09 Nov 1959 ms w/Hanus L.
WA 091 Hagge Hanus L. 1885 20 Jun 1961 ms w/Agnes M.
EA 060 Hall Alma E. 1924 ss w/Clifford R.
NA 024 Hall Georgia F. 1911 08 Jul 1997 Id; ss w/Glen; Am Legion Aux. NA 112 Halupnick Ardell K. 1919 w/o Leonard J.
WA 111 Halupnik George R. 12 Dec 1906 10 Nov 1962 ms w/Luella E.
WA 111 Halupnik Luella E. 04 Oct 1907 08 Dec 1994 ms w/George R.
OG 075 Halvorson Bernice L. 1893 1977 ss w/Nelius O.
OG 075 Halvorson Nelius O. 1884 1970 ss w/Bernice L.
NG 235 Hamilton Harry A. 1882 Feb 1980 ss w/Iva H.
NG 235 Hamilton Iva H. Lorenzen 1887 1990 ss w/Harry A.
OG 000 Hankerson Margaret J. 04 Nov 1861 5y; d/o J.R. & E.S. WA 020 Hansen Isaac N. 1853 07 Jul 1949 Id; h/o Jennie E.
NG 187 Harder Anna 1877 08 Dec 1941 Id; ss w/Herman E.
NG 187 Harder John Sr 1846 1931 Match'g stone w/Dorothea M.
WA 054 Hargan Effye E. 04 Aug 1889 28 Oct 1977 ss w/Richard M.
WA 002 Harrison Rebecca L. 1933 w/o George R.
OG 153 Hartman Rosana 1852 1917 w/o Chester T.
OG 119 Hartshorn Agnes 12 Jul 1842 17 Aug 1894 ss w/H. A.
OG 119 Hartshorn Maggie L. 07 Apr 1866 09 Mar 1873 ss w/Mollie Q.
OG 119 Hartshorn Mollie Q. 22 Jan 1874 18 Aug 1875 ss w/Maggie L.
OG 119 Hartshorn Philinda 09 Apr 1860 20y 4m; w/o H.A. WA 16 Hatton Ethel May 1889 26 Jan 1942 Id; ss w/John F.
WA 114 Hatton James C. 1891 31 Aug 1969 Id; ss w/Susie C.
WA 114 Hatton Susie C. 1888 17 Jul 1967 Id; ss w/James C.
WA 073 Head Emma C. 1870 08 Feb 1944 Id; ms w/John W.
WA 073 Head John W. 1866 01 Mar 1950 Id; ms w/Emma C.
WA 169 Heckroth Margaret C. 1910 12 Oct 1966 Id; Mother; ss w/Glen H.
NA 037 Hendershot Ethel Mae 1901 02 Apr 1963 Id; w/o William J.
OG 117 Henning Blythe Floyd 02 Mar 1904 06 Jan 1905 s/o H.H. &M.A. WA 032 Henry Fannye G. 1887 24 Sep 1960 Id; ss w/Robert A.
NA 068 Herink Ella E. 1895 May 1973 ss w/Joseph F.
WA 150 Hild Anna M. 1883 06 Oct 1970 Id; ss w/Robert H.
NA 035 Hild George R. 1905 02 Aug 1966 Id; h/o Cora M.
WA 150 Hild Robert H. 1876 Jun 1956 ss w/Anna M.
NG 161 Hill Edith 05 Jul 1881 2 wks; d/o J.H. & M.E. WA 132 Hines Benjamin Frank 1854 01 Apr 1934 Id; ss w/Nellie M.
OG 126 Hitchner America P. 10 Dec 1856 1y 9d; d/o W.D & M.M.;worn! OG 126 Hitchner Augusta J. 18 Aug 1855 13d; d/o W.D. & M.M.;worn! NA 074 Hoeg Loren E. 1905 19 May 1978 Id; ss w/Hattie M.
OG 026 Holeman Martha A. 1847 no marker; dte from 1870 census; w/o James R.
NA 036 Hollmann Golden Stanfield 1893 14 Dec 1987 Id; ss w/John B.
WA 070 Holst Alfred 1880 03 Jul 1958 Id; ms w/Katie L.
WA 070 Holst Arlin J. 1912 1982 ss w/Ruth M.
NA 093 Holst Edna B. 1913 20 Mar 1997 Id; ss w/Ray A.
NA 093 Holst Ray A. 1910 20 Sep 1976 Id; ss w/Edna B.
WA 070 Holst Ruth M. 1916 ss w/Arlin J.
WA 147 Holub Libbie A. 1895 19 Dec 1994 Id; ss w/William F.
WA 047 Holub William F. 1892 1984 ss w/Libbie A.
NG 079 Horsfall David Moss 28 Apr 1849 08 Apr 1904 h/o Mary J.
WA 102 Hotzel Abbie W. 1870 29 Oct 1952 Id; ms w/Frank W.
NA 034 Hotzel Earl F. 1891 30 Jul 1988 Id; ss w/Elsie M.
NG 027 Hotzel Emma Inf dau of A. H and M.
WA 139 Howard Edward 1846 05 Apr 1935 Id; ms w/Margaret J.
NA 031 Howard Ellen LaRue 1900 22 Jan 1994 Id; ss w/Warren A.
WA 051 Howard Hepzibeth 1861 03 Nov 1955 Id; ss w/Henry L.
OG 003 Howard Lizzie 1873 1876 c/o John Howard? OG 003 Howard Lucina G. no marker; c/o John Howard? WA 119 Howard William 1856 06 Aug 1940 Id; ms w/Jennie L.
OG 012 Huff John C. 24 Dec 1881 7y2m17d; s/o J.B. & M.J.
OG 012 Huff Mary J. 24 Feb 1888 30y 5m 20d; w/o John B.
NA 110 Hulme Lavon E. 1913 07 Dec 1983 Id; w/o Dale; Am Legion Aux. NA 100 Hulme Lola L. 1919 ss w/Arlo R.
NG 169 Hulse Maude E. 1894 1977 Match'g stone w/Robert R.
NG 177 Hulse Robert R. 1889 04 Aug 1961 Id; Match'g stone w/Maude E.
WA 072 Hurlbert Ada L. 1864 28 Feb 1951 Id; ms w/Fred J.
WA 072 Hurlbert Fred J. 1858 1924 ss w/Ada L.
NA 010 Hyland Donald H. 1892 15 Jul 1958 Id; ss w/Edith P.
NA 010 Hyland Edith P. 1892 12 May 1955 ss w/Donald H.
OG 022 Ingham Gertrude Kahler 21 Sep 1891 31 Aug 1937 Originally listed as Ingraham. I have this note from Cynthia Ingham Gage: "She is incorrectly listed as Gertrude Kahler 'Ingraham'. The correct spelling of her last name is INGHAM. Birth and death dates are listed on the marker. She is the daughter of Marcus and Lena Kahler, whom she is buried near; and the wife of Harold Ingham who is buried in Woodlawn Cemetery in Toledo with his ancestors." WA 031 Irvine Arthur 1880 1921 ss w/Cora E.
NA 029 Irvine David William 15 Oct 1958 Only 1 date; c/o Wm E.
NA 109 Jacobs Luella M. 1907 w/o Leonard A.
EA 064 Jacobs Sandra J. 21 Apr 1956 ss w/Steven D.
WA 036 Jacobsen Fred 1894 1914 s/o John A & Mary C.
WA 036 Jacobsen Mary C. 1873 1929 w/o John A.
NA 032 Janssen Arvella E. 1918 ss w/Alvin H.
NA 045 Janssen B.Hugo 1913 01 Sep 1971 Id; ss w/Helen G.
NA 100 Johnsen Victor 1918 ss w/Irma L.
WA 127 Johnson Fred J. 1874 27 Nov 1959 Id; Father; ss w/Emma M.
NA 101 Johnson Leola A. 01 Nov 1907 11 May 1990 ss w/Beryl R.
OG 022 Kahler Lena C. 14 Mar 1859 03 Jan 1932 ss w/Marcus H.
OG 022 Kahler Marcus H. 12 Jul 1843 01 Mar 1905 ss w/Lena C.
WA 083 Kanis Anna L. 1889 1982 ss w/Henry A.
WA 083 Kanis Henry A. 1891 1970 ss w/Anna L.
WA 046 Karkosh Anna 27 Apr 1880 13 Nov 1953 Mother; ss w/Louis J.
NA 019 Karkosh John C. 1882 1978 ss w/Mary M.
NA 019 Karkosh Mary M. 1883 1970 ss w/John C.
WA 110 Keith Elizabeth 1883 07 Nov 1962 ss w/William C.
NG 039 Keith James B. 1860 1933 Father; ms w/Mary H.
NG 039 Keith Mary H. 1871 1918 Mother; ms w/James B.
OG 084 Keller Roy M. Sr 1902 1971 ss w/Frances L.
WA 068 Kennedy Edna M. 1882 1962 Mother; ss w/George B.
WA 068 Kennedy George B. 1865 1937 Father; ss w/Edna M.
NA 017 Kern Alice E. 1901 26 Sep 1983 Id; ss w/Lowell A.
NA 017 Kern Lowell A. 1899 May 1979 ss w/Alice E.
NA 058 Kersten Floyd 1906 20 Oct 1981 Id; ss w/Sarah M.
NG 022 Kibbee Matilda A. 1845 25 Sep 1881 Age 36y ?m 12d; very worn; w/o Alonzo B.
NA 089 Kibby Jean E. 1916 21 Feb 1994 Id; w/o John W. IV & Gilbert E.
OG 058 Kiedel Anna J. 1855 1938 Match'g stone w/Albert E.
NA 113 Kinkade Dustin John 12 Jun 1977 13 Aug 1989 s/o Doug &Joan K.
OG 109 Kittrell Emma 1865 1937 ss w/James W.
NG 118 Knoop Chris F. 1899 08 May 1970 Id; ss w/Ella B.
NG 118 Knoop Ella B. 1893 12 Dec 1979 Id; ss w/Chris F.
NA 013 Knoop Marcus P. 1903 1974 ss w/Vanetta A.
OG 102 Kober Elizabeth J. 1841 1920 Mother; w/o George F.
NG 236 Kolp Edward 1878 very worn-can't read "Edward"
NG 236 Kolp Henry A. 1842 1932 Father; Mason; ss w/Susan W.
NG 236 Kolp Susan W. 1846 1938 Mother; ss w/Henry A.
WA 106 Kolpek Emanuel E. 1896 1984 ss w/Julia M.
NG 139 Kostlan Anna 1903 Maje 1903; temiela? Yemieta? NA 110 Kostlan Douglas s/o Mary L & James J.
NA 005 Kostlan Emma 1896 Nov 1986 ss w/Joseph F.
NA 110 Kostlan Mary L. 1930 w/o James J.
NA 005 Kostlan Violet E. 1901 07 Jul 1964 Id; ss w/George F.
WA 083 Kriegel Betty Scott 04 Nov 1905 28 Dec 1984 ms w/Melvin W.
OG 078 Kubik John K. 1893 29 Jun 1954 Id; ss w/Julia M.
WA 077 Kubik Josie Dedic 1888 1989 ms w/Frank N.
OG 078 Kubik Julia M. 1893 1969 ss w/John K.
NA 049 Kubik Martha 1919 ss w/Richard A.
NA 012 Kubik Mary 1881 05 Jan 1967 Id; ss w/Joseph R.
OG 012 Kutin Frances Kucera 1846 1919 "Fannie"
OG 132 Kynett L. J. M.D. 1841 1912; H/o Zoe A.
WA 133 Ladd Della Owner? ; is this Eudella? NG 091 Ladd Gracie J. 29 Aug 1888 17 Jan 1891 d/o G. D. & M. M.
OG 075 Ladd Janet 1832 1927 ss w/D. C.
NG 091 Ladd Mary M. McKerral 13 Feb 1863 26 Jan 1891 w/o George D.
OG 075 Ladd Nancy E. 1841 1917 w/o Fred G.
NA 076 Lang John R. 31 May 1937 ss w/Elaine R; f/o Kevin J/ DavidK/ Elizabeth A/Christiana E.
WA 094 LeFevre Joseph M. 1891 ss w/Minnie M.
EA 065 LeFevre Ralph J. 1917 ss w/Loraine L.
OG 123 Lefler David? 24 Apr 1865 72y 4m; top half stone brokenoff-can't read "David"
WA 028 Lehmeier Paula J. 22 Nov 1941 06 May 1999 ss w/Richard L.
OG 110 Leuders Irene 1897 1971 ss w/Wm; named spelled "Leu.."
OG 057 Little Ernie C or G. 1878 Child mrkr barely readable; s/o R.B. & V. or W.
OG 110 Lueders Betty J. 1931 ss w/Harold; named spelled "Lue..."